Perfect for cars where light build up of baked-on brake dust has started. Designed to quickly remove dirt and brake dust with ease. Closest product to a touchless wheel clean. Makes regular wheel cleaning quick and easy. Spray product on all four wheels, allow product to dwell for 5 minutes, rinse o thoroughly with a pressure washer or hose. 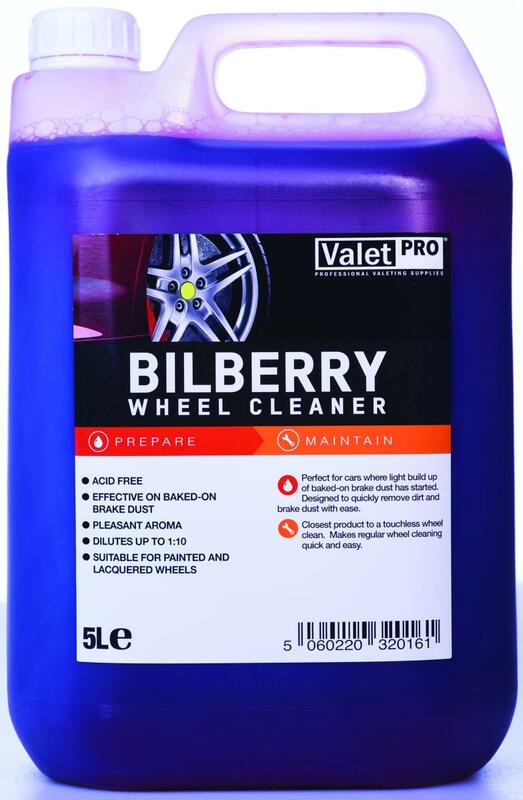 If needed re-spray wheels and agitate with a soft, ValetPRO wheel brush. Not suitable for un-lacquered polished rims. Causes severe skin burns and eye damage.Precautionary Statements: Do not breath spray. Wash hands thoroughly after handling. Wear eye protection, protective gloves. IF SWALLOWED: rinse mouth. Do NOT induce vomiting. IF ON SKIN (or hair): Remove/take o immediately all contaminated clothing. Rinse skin with water/shower. IF INHALED: Remove victim to fresh air and keep at rest in a position comfortable for breathing. IF IN EYES: Rinse cautiously with water for several minutes. Remove contact lenses, if present and easy to do. Continue rinsing. Get immediate medical attention. Store locked up.